Castle Cottage is situated within the ancient parish of Thorpe Salvin. 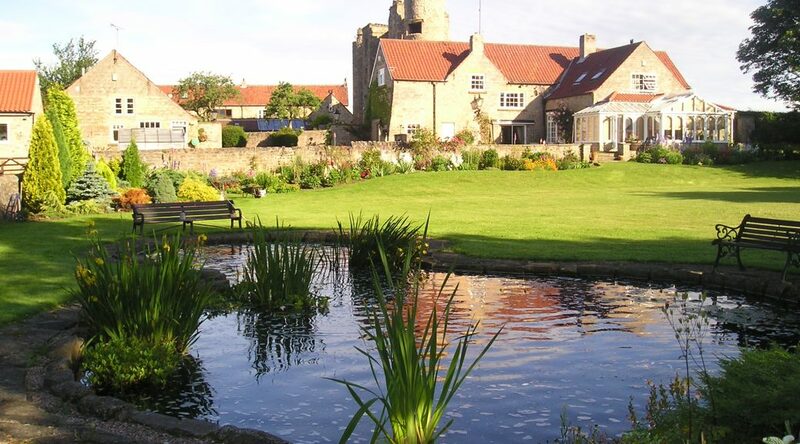 Within the grounds of Castle Cottage lies an Elizabethan manor house, Thorpe Salvin Hall, built in 1570 and said to be the inspiration for Torquilstone in the novel Ivanhoe by Sir Walter Scott. The jewel in the crown, Europe in Bloom Gold Medal Winner 2002, Britain in Bloom Winner 2001,1994, and 1992. This extremely pretty and floral village is well worth a visit. Don’t miss the fabulous two day Garden Trail, an event for both gardeners and enthusiasts alike. Visitors travel from far and wide to browse and enjoy the private gardens opened to the public during this special event. The 12th Century Church of St Peter is remarkable for its handsome Saxon Doorway. In the interior is a very curious stone Font, upon which are cut in the following figures representing the seasons of the year. Winter is figured by an old man warming himself before a fire in a chimney; Spring, by one riding out a hawking; Summer by a man reaping corn and bundling it up into sheaves; and Autumn, by a husbandman sowing seed. The other compartments exhibit the ceremony of Baptism with the parents and sponsors. The church tower, and other major structures are 12th century, and the south wall of the nave is 15th century. The pub and eatery ‘The Parish Oven’. The Chesterfield Canal runs close by and there are pleasant small areas of woodland. Netherthorpe Airfield is only a mile away. The name Thorpe has Norse roots and is derived from Torp or outlying farmstead. Mentioned in the great land survey of 1085, the Domesday book as part of Roger De Busli’s Laughton estate, possibly as Rynkenild Torp, for its place on the ancient Rynkenild Street highway (also once a Roman road on the same track as modern Packman Lane, and said to be haunted by a squad of eternally marching ghostly Roman soldiers!). In the late 13th century during the reign of Edward I Longshanks the village belonged to the knight Sir Ralph Salvain from which the name Salvin is eventually derived. Another 1284 survey known as Kirby’s Inquest refers to the village as Rikenild Torp. In 1339 King Edward III grants Anketyne Salvain free warren in all his demesne lands of Thorp Salvain free warren meant the right to hunt, rear, and preserve game this is the first time the village is referred to as Thorp Salvain. About this time although the exact date is unknown the Salvains built the first Thorpe Manor on the site of the present ruin, this first manor was probably built of wood. One of the great events in English history was the 1378 Poll Tax of Richard II where there is a surviving record of the tax being placed on the inhabitants of the village. Around 1400 Thorpe fell under the ownership of the Sandford family who succeeded the Salvains as Lords of Thorpe Manor. Thorpe Hall was designed and re-built by the master mason Robert Smythson for Brian Sandford sometime between 1565 and 1582. Brian Sandford deserted Richard III at the Battle of Bosworth 1485 to join Henry Tudor together with the treaturous Stanleys. He chose the right side and was rewarded with among, other things, 12 quick Does from the royal park at Conisborough (where castle still stands) to stock his park at Thorp. Edward Osborne acquired Thorpe Hall from the Sandfords in 1636 and his successor Sir Thomas Osborne Earl of Danby was Charles II’s chief minister before becoming the Duke of Leeds in 1694, in 1697 he moved to a palatial residence in neighbouring Kiveton Park. Several of the public houses in the area are hence called Leeds Arms. Thorpe Hall was never again occupied, and fell into ruin. Only the western facade of the impressive mansion has survived but the layout of the fortified house can be determined by careful examination of the foundations. It is built of soft sandstone. At the corners of the western facade are drum towers and the foundations of similar towers can be seen at the other two corners. The house appears to have been square with towers at each corner. There are stumps of pseudobattlements along the roof line and the windows are of mullion type. In 1990 you could just see the bases of Elizabethan chimneys which must have been tall and of red brick. In the centre of the west front is a square porch rising to the full height of the house. In front of the house is the picturesque gate house. The gatehouse is very small with a stepped gable roof (unusual Dutch/Jacobean style). The original door is still in place but unused. It has an upper floor which at one time was used as a dovecote. The nest boxes are of old pantiles. The house porch also has some of these pantile nest boxes in the upper floor. On the inner side of the facade, stone fireplaces and ovens are still visible and if the house was of the tower type there would have been a central courtyard. Over the previous 30 years the ruin has decayed significantly, Eric Tracey is the current owner and in association with English Heritage is currently seeking for financial help to perform necessary work on the ruin in order to take it off the ‘Buildings at Risk’ register. The missing stone has doubtless provided the building material for many of the surrounding properties over the centuries. For more information see the following link “http://www.j31.co.uk/thorhall.htm\” .